The Sheetz Z-Card® is the perfect choice when rewarding someone for a job well done! Whether your recipients are redeeming their Z-Card for gasoline, food from our award-winning M•T•O® menu or any of our self-serve or specialty Sheetz Bros. Coffeez® beverages, they are sure to find what they’re looking for at Sheetz! Sheetz offers its customers quality convenience for a great value every day. Choose from subs, salads, wraps, burgers, fries, hot dogs and more from our unique touch screen ordering system. We also offer a full line of specialty coffee beverages made-to-order by trained baristas! Enjoy espressos, cappuccinos, mochas or lattes made with 100% Arabica coffee beans. We serve hot, iced and frozen coffee beverages and a full line of fresh fruit smoothies. Our made-to-order menu is made fresh every day and available 24 hours a day, 7 days a week, 365 days a year! Sheetz prides itself on its fast and friendly service. As an on-the-go customer, you can take comfort in the fact that we will be there when you need us most. Not only are we ready to keep you refreshed and refueled, we have what your vehicle needs too. All Sheetz gasoline is 100% quality guaranteed! Our fuel meets or exceeds the most stringent EPA requirements. In addition, some of our locations offer car washes that can give your vehicle that extra sparkle! It’s clear to see … when you give the Sheetz Z-Card you’re giving the gift of convenience. Sheetz has what you want when you want it. The Sheetz Z-Card is the perfect gift any day! Z-Cards are redeemable at all of our over 550 locations in PA, MD, OH, WV, VA and NC. You can purchase Z-Cards in denominations of $25, $50 and $100 for easy distribution. A prepaid card redeemable for all purchases at all locations in PA, MD, OH, WV, VA and NC. No Fees. Cannot be used as payment on Sheetz charge or credit card. 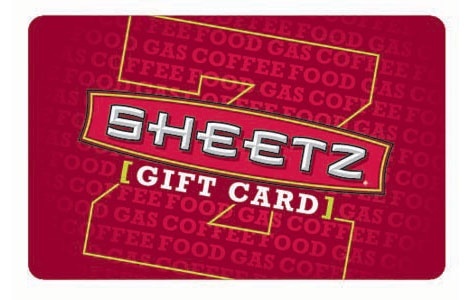 For gift card balance, www.sheetz.com or call 1-888-239-2856.